Kipling has reached that point in his growth (approximately 21" at the withers as of this weekend) where keeping weight on him is difficult. Like most teenagers, he pretty much has the metabolism to eat whatever he has in front of him, then look for more food - and not gain an ounce on double rations. He's still a baby and I do like the baby dogs to be on the lean and mean side of the spectrum, but I'd like him to gain a little so that he has some reserves for winter and since he's hitting the breed ring a few more times this fall I want him to get some more meat on his bones so he's not so ribby. Not tens of pounds mind you -but 2 pounds would fill him out just a bit around the ribcage. This week Kipling is eating about 1.5 cups of Honest Kitchen Thrive, 2 duck necks and about 2# of raw mix a day. Then I replace one meal a week with either Tefco Green Tripe or Tefco Performance Dog, and typically one meal a week of a whole sardine or a whole mackerel. That's a lot of food. The big dogs are eating about the same - Teller a little less (4 necks for breakfast and about 1# of raw meat/veggie) and Murphy less than that (2 necks for breakfast and 1/2# to 3/4# raw mix for dinner) and their weekly tripe and fish meals. Is there really any wonder we have to order our food wholesale in 500# orders? In the summer those numbers change pretty drastically (up) to keep weight on Teller who spends so much time in the pool he's usually up to 5# of food/day by the time August rolls around - in addition to all the training treats he gets when he's working a lot. Even then we'll get to a point when he (and now Kipling) needs some help to keep weight on. Unfortunately for me, when I tried to up Kipling's food a bit I discovered we'd reached the point where adding more food would have some pretty disastrous results (which took us several days to resolve via chicken and rice, then pumpkin, then pepto and finally some flagyl). In other words, it's time to turn to Annie for some assistance. Annie you ask? But of course. My proven method for adding a bit or keeping weight on an active intact (or growing puppy). Mac and Cheese has helped me stabilize Teller's weight in the summer and it's my first thought now with Kipling too. I feel a bit better about Annie's Mac and Cheese over the other blue box brand - hey, at least these grains are organic! 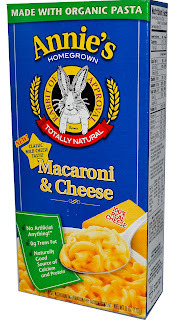 I know that it seems somewhat counter-intuitive to feed macaroni and cheese to dogs on a grain-free, gluten free diet - but, since my dogs are grain and gluten limited by my choice, not by allergic restriction, I find that adding carbs in this situation is a great way to boost them up a little bit somewhat naturally. 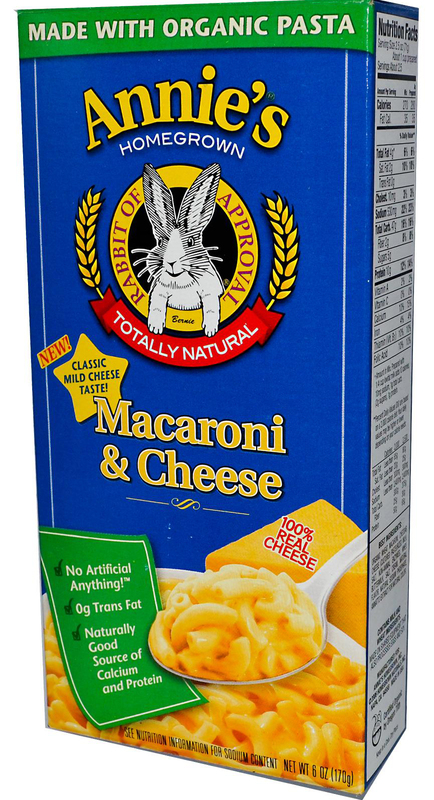 I also find that the cheese package contributes nicely to the caloric package (one cup adds approximately 280 calories) - I do not prepare the mac and cheese as directed - just the pasta, some water from the pasta pot and the orange packet of theoretical goodness. I hear lots of weight gain success stories with Satin Balls (recipe here) or grocery store meatballs (we do buy and use Costco's Kirkland meatballs for training treats) but I find mac and cheese to be well tolerated by even sensitive tummies, seems to be very digestible and is so simple to have on demand when I need it. Ten minutes of preparation and I have mac and cheese in the fridge for three to four days - one batch of Satin balls (or 6lbs of costco meatballs) is a lot of commitment! So for dinner tonight, Kipling had 1 cup of Annie's Mac and Cheese and a little over a pound of his Oma's Pride Chicken Mix (a bit less than normal) - he'll get another cup each meal for the next few meals and I'll evaluate progress on a daily basis. The goal is to add very slowly, keeping the digestive system happy and stable. We really don't want to overload the system again! For conversion purposes - one pound of Oma's turkey mix is about 544 calories; two cups of Mac and Cheese is about 560 calories. Carb load in the raw mix is 1.65%; carb load in Mac and Cheese is 16%. Oh and yes, Murphy and Teller got a bit of mac and cheese as well. M&C is one of Murphy's very favorite treats.